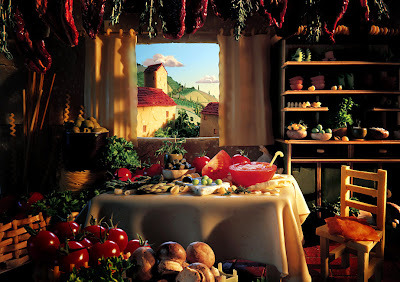 Photographer Carl Warner painstakingly captures all forms of food in a series of still life's with edible ingredients he raided from his kitchen cupboards to design a series of dreamy landscapes and homey domestic scenes that appear scrumptiously good enough to eat. 1. Salmon Seas Take a close look at this dusk scene and you'll discover it's good enough to eat -- the pebbles and rocks are potatoes and soda bread, while the red sky at night and sea are entirely formed of strips of salmon. 2. Italian Home An Italian style home made just from vegetables and fruits. 3. Bread Mountain Loaves of bread as mountains. 4. Fruity Balloons The trees, of course, are made from broccolis! The "rows" of farmland are made of corn, asparagus, and zucchini. Potatoes stand in for rocks. 5. Cheesy Tuscan Villa The castle is made out of cheese, the walls out of rice, and the wagon wheels out of mushrooms! 6. Vege Cave A sea cave made of bread, carrots crabs and a lobster. 7. 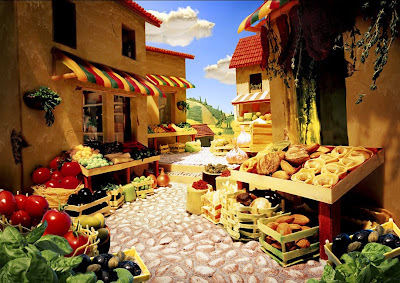 Vegetable Market This Italian inspired rural scene includes a lasagna cart, fields of pasta, a pine nut wall, mozzarella clouds, trees of peppers and chilies and a parmesan village. 8. 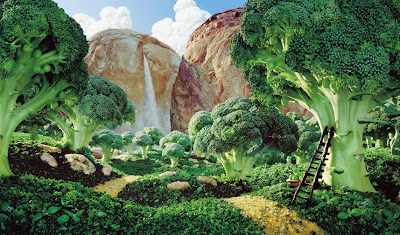 A Forest of Greens A landscape made of bread and broccoli cabbage. 9. Sea Cliff A sea cliff made of Parmigiano cheese, potatoes and cabbage. 10. Stormy Sea A boat made of watermelon, peas, olives and asparagus plough trough a stormy seas made of radicchio salad. 11. 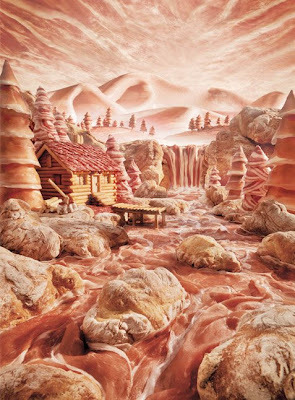 Mountain Landscapes Mountain landscapes below, relized with ham, salami and other cold cuts which had been used for an ad campaign by the Italian brand Negroni. The resourceful and ingenious series requires numerous shots -- Carl first sketches out a traditional landscape scene before introducing the food. Each scene is then captured in separate layers to prevent the food from wilting. He then uses computer technology to combine them into a single final print. 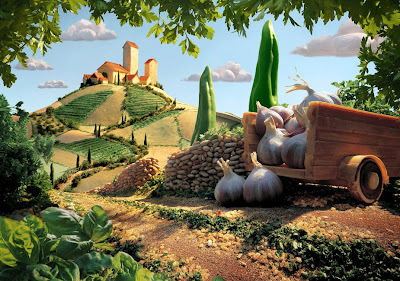 To give a realistic 3-D feel to the photos, each still life is composed on an 8 foot by 4 foot table. The foreground is only about 2 feet across. 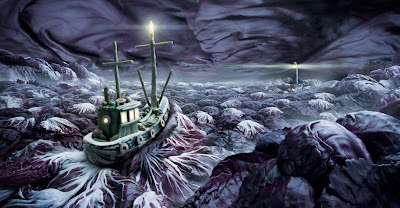 The artist from Tonbridge, Kent creates amazing panoramas, including a broccoli forest, bread mountains, a cheese village, and smoked salmon seas. "I like the way smaller aspects of nature resembled larger ones." says Warner. The success of the project has motivated Warner to plan for the images to be released in an educational book to encourage kids to eat healthier. He says his 'Foodscapes' were partly inspired by healthy eating campaigns, but they haven't persuaded his own children to take up the 5-a-day pledge. "But at least they don't play with their food as much as I do." said Carl. 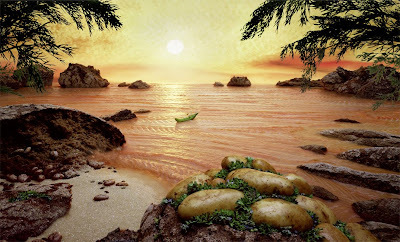 Take a close look at this dusk scene and you'll discover it's good enough to eat -- the pebbles and rocks are potatoes and soda bread, while the red sky at night and sea are entirely formed of strips of salmon. 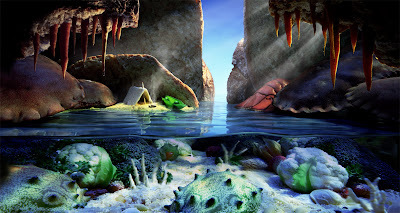 7 Amazing Holes - Don't Dare to Miss this!